In this blog, I demonstrate four different push ups variations — each progressively more challenging — and there is a bonus sections where a guest demonstrates the perfect pushup for your shoulder and joint health. We will end the blog with the Perfect Pushup. Let’s start with Wall Pushups. Wall Pushups are one of the Beginner level Strength exercises in the Exercise for Better Bones program. With wall push ups, what you want to do is ensure that your hands are at the height of your shoulder through your push up. If I’m standing arm-length distance away, I’m going to point my hands in towards one another. I’m going to have them one and a half shoulder-width apart. If my shoulders are 14 inches, I want to go to about a 21 inch width to get a more comfortable distance between my hands to focus on my pecs. Take a nice breath in, slowly exhale as you come in, and push away from the wall. You want to use your abdominals to stop your body from sagging. You want to keep your ears, shoulder, hip and knee in alignment through your push-up. Two things to mention here. 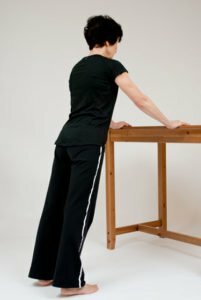 If you’re feeling like you’re getting more of a stretch in your calf, and that’s actually stopping you from getting the most out of your push-up, allow yourself to roll forward onto the balls of your feet. So you don’t have to keep your heels down through your push up. If you’re finding that the straight arm is too easy for you, then step away from the wall. As I step away eight inches from the wall, I’m going to lower my hands roughly eight inches so that I’m staying in that leaning tower position. I’m going to push down and push the wall away from me as I come out. Breath in, exhale, pushing as you come up. The step push ups weight bearing exercise is an Active level strength exercises targeted at the following muscles: chest, triceps, and abdominals; and the following bones: wrists and spine. With the step push ups, you may actually want to start on the fourth or fifth step of stairs in your house, going down. It’s easiest for me to just use the step that I have, but it is a fairly low step, so I don’t encourage you to start here unless you have a lot of experience doing pushups. 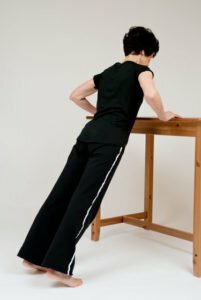 The form is exactly the same, so regardless of the height, whether it’s from your table, whether it’s from your kitchen counter top, or the third step, and you progressively work your way down. You want to have your hands directly underneath your shoulders. You also want to have your hands about one and a half shoulder-width apart, so for me that’s about 21 inches, my shoulders are about 14 inches. I’m going to turn my hands in to face one another slightly, and from this position, I’m now going to step back without moving my arms back, so I’m going to keep my arms in line with my hands. I’m going to step a hip-width back, take my breath in, and exhale when I’m coming down, and allowing my upper arms to get to a point where they’re parallel to the surface. Breath in, come down, when my arms are parallel to the surface, and press back. A lot of times when I’m coaching individuals on push ups we see the surface and you want to get there as fast as possible, so I often see people going down and leading with their head. This is teaching us really bad habits in terms of every time we push something, we’re doing this motion. You want to use that cuing and if you need to use a stick, do so. If you need to stick it down your shirt, that’s perfectly fine. What you would do just for that cuing, if you don’t have someone to hold it there for you, if you just stick it down so that you have that feedback in the back of your head to keep your head as close to the stick or in line with the stick as you can with your pushup. Take your breath in, and down. That way, you don’t have that tendency anymore to come forward and undo any of the great postural work that you’ve been doing through your program. And that’s it for the step push ups. Here is some additional guidance for health professionals on the step push ups exercise. The Floor Push ups is an Athletic level strength exercise from the Exercise for Better Bones Program. The exercise targets muscles in the chest, triceps and abdominals as well as bones in the wrists, hips and spine. I demonstrate the exercise in this video. With the floor push ups at athletic level, we’re doing it from the floor. You want to have your hands positioned, wider than shoulder, up to one and a half shoulder-widths. I’m a 14 inch shoulder width, so I can place my hands up to 21 inches in width. I like to have the hands turned slightly towards one another, and the elbows are going to go out to the side. You want your hands underneath your shoulders. You’re going to be out onto the balls of your feet, toes right underneath you, equal weight-bearing through all your toes. With your floor push ups, your upper arms is coming down to where you’re parallel to the floor and press back away. You want to ensure that your entire body is moving towards the floor simultaneously. You don’t want your head leading or your pelvis leading, and one training tip that works really nicely is to place a ruler down your shirt. And gentlemen, if you don’t have a bra to place it in, you can at least place it through your t-shirt and then into your shorts. So taking that, that’s going to ensure that your head stays in line, so you’re not coming down in here or in here first. And that’s it for the floor push ups. The Twist Push Ups is a strength exercise from the Exercise for Better Bones program specifically designed for the Elite Level. The exercise targets the muscles of the chest, triceps, deep abdominals and back. It also targets the bones in the wrist, spine and hips. With the twist push ups, the only tricky part is your foot position, in that you want to have your feet wide enough apart so that when you rotate, you’re able to go onto the inside and also the outside of each foot without them getting in each other’s way. The twist push ups is done once you’ve mastered your floor push ups. With your feet at least 10 inches apart, depending on the size of your feet, you want to have your hands under your shoulders. They can be slightly wider than shoulder width up to one and a half shoulder-width apart. You take your breath in, go down, full push-up. As you come out of it, you explode up onto one hand. Back down, and explode up. You want to note here the position of the feet, and in the side plank position, you are maintaining your body alignment, so your head is in line with your sternum and with your pelvis, so you’re not dropping or going too high through your plank position with the twist. So a training tip would be to use this with the ruler. I’m going to demonstrate it now with the ruler. And that’s it for the elite-level twist push ups. Push ups are a popular exercise. But could you damage your shoulder if you do not do push ups properly? You could, so you need to do the perfect pushup. I recently met with Marjorie Gingras, a Montreal-based Physiotherapist and specialist in shoulder treatment, and we were able to produce a video where Marjorie shows several pushup positions that compromise your shoulder. She then demonstrates a perfect pushup for your shoulder. Hello, everyone, my name is Marjorie. I am a physical therapist passionate about shoulders and I am sharing with you today, the pushup. Incorrect pushup would be to me, is that if your body goes too low, closer to the surface. Meaning that the shoulder is going to glide in front because you’re going too deep into it. So you want to keep a limit that your arm is going to stay parallel to the surface and don’t go lower than that.The other side of the pushup is the shoulder blade stability. So many people, they go so deep and they make it so difficult that they get the shoulder blade all the way together in the middle so they just bang and they just stay there. So when you are starting your pushup, you’ve got to keep a good contraction with your shoulder blades apart. And when you go deep, the shoulder blades are going to move, of course, but you don’t want them to glide all the way together and feel a pinch of skin between them. So keep that limited with the proper alignment, and this is going to be a perfect pushup. 6. Are Push Ups Good for Osteoporosis? Some clients ask me if push ups are good fro osteoporosis. 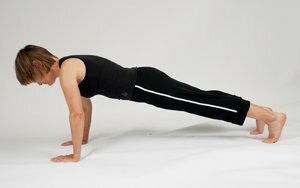 Read my blog on Planks and Pushups for Osteoporosis.